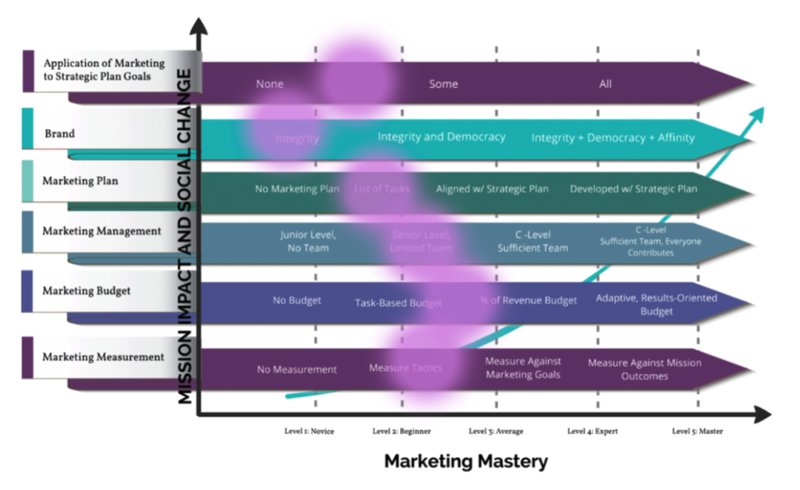 What does marketing mastery look like, and how close is your organization to achieving it? Take the Diagnostic Assessment and receive your Nonprofit Marketing Mastery Curve heat map and analysis. Take our diagnostic assessment and receive your Nonprofit Marketing Mastery Curve heat map and analysis. Most nonprofits fall somewhere across this spectrum of marketing mastery: novice, beginner, average, expert, master. Marketing is inextricably tied to your nonprofit’s ability to advance its mission, so if your organization is at the novice level, there is a good chance you’re struggling in other areas as well. But as you move up the spectrum toward marketing mastery, your ability to make meaningful strides toward your mission and drive social change will continue to grow. Take the Nonprofit Marketing Mastery Diagnostic Assessment now to receive your heat map and learn where your organization lands on the spectrum.